While trying to nab a cicada from the small trees planted on the grounds at our experiment station here in Fontezuela, Argentina, I happened to notice a bit of movement on one of the branches nearest to me (while the cicada flew off with a screech and a clatter). A closer look revealed what looked like a slight protuberance of the branch to be a nymphal planthopper (family Fulgoridae), and at ~15 mm in length a pretty good-sized one at that. I would have never noticed it had it not moved, so good was its camouflage, but I didn’t have the time to spend trying to photograph it right then and there. Instead, I popped it into a vial (you do always carry a vial with you, don’t you?) and continued my fruitless quest for cicadas. Later that evening I placed it on a palm tree in the hotel courtyard (not really the appropriate host, but it was the only real tree available). 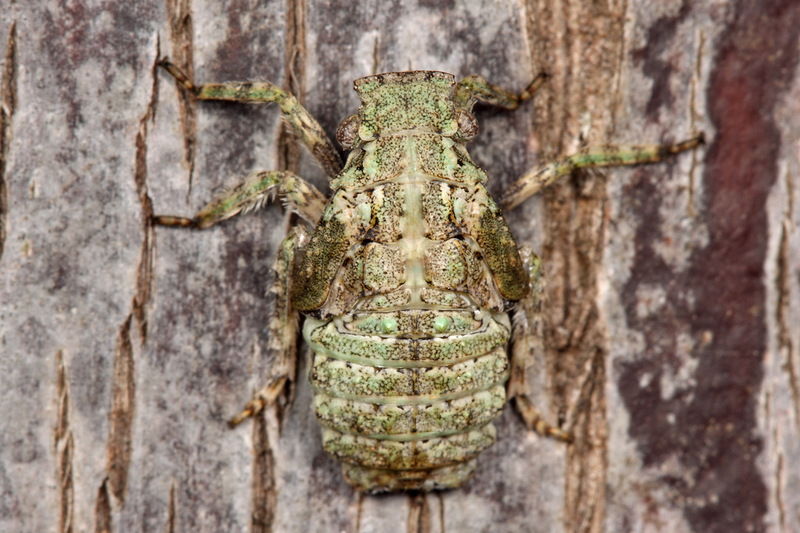 I took the standard dorsal view photo, and while not as good a color match as the (still undetermined) tree upon which I found it one still gets a sense for how difficult it might have been to see this nymph flattened against the slightly greenish bark. A lateral profile view makes the bug much more visible. One thing I’ve learned from much better photographers than myself is to get down and low relative to the subject—even to the point of looking up at it if possible. This provides views that are far more interesting than the typical looking-down-from-above shots. 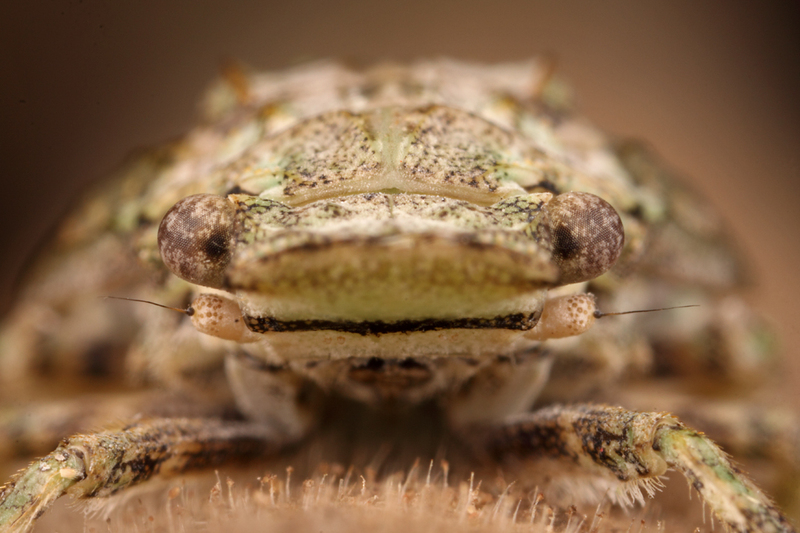 In the case of this nymph, the above and following low-angle shots really brought it to life and emphasize its unusual form. Even lower. How did I get the nymph to "prop" itself? Of course, with the nymph on the side of a fairly large tree, one can only get so low. To get even lower, I placed the nymph on a small stick and used hand-holding and bracing techniques to get even lower. I took quite a few shots experimenting with composition, and the shots I ended up liking the best were frontal-oblique from slightly below bug-level with the stick rather sharply angled down and the bug slightly propped up on its front legs. Easier said than done—this nymph was loathe to stop crawling once I moved it to the stick and tended to be negatively geotactic (crawled upwards). As a result, every time I angled the stick downward it would turn around and start crawling the other way, and in any case when it did stop it tended to flatten itself against the branch. Through trial and error, I learned that if I braced my thumb and forefinger against its head/pronotum to stop its progress and held it in place for awhile it would stay put. I also learned that if I slightly blew on its face when it was flattened against the branch that it would prop itself upwards a bit. Thus, for this shot it was a matter of letting it crawl upwards almost to the end of the stick (to eliminate excess stick that poke into the camera with a frontal-oblique angle), bracing it for a moment, inverting the stick downward and pointing slightly towards the camera, and then blowing on its face a bit—simple, huh? The black transverse band on the lower face adds a lot of character to the shot. The face-on shot is a staple for me, but even with this shot the angle is important—angle the back of the stick down too much and you get the all black background (not in itself bad, just not what I wanted for this shot), angle it too high and too much of the back of the bug shows up as blurred clutter in the background). The foreward projecting “nose” of this nymph prevented me from getting both the tip of the nose and the eyes in focus (without using excessively small aperatures), so I opted for the latter (I’ve never seen a good face shot of an insect in which at least the eyes were not in focus). Unfortunately, family-level identification is as good as it is going to get for this individual. I sent the photos to fulgorid expert Lois O’Brien, who eliminated several options but couldn’t narrow down further among several remaining possible genera (“Our ignorance of nymphs is abysmal…”). Her recommendation was to go back to the tree and try to find adults, and apparently some species tend to live on the same tree for years and years. I’ll be returning to Fontezuela later in April—hopefully the fall season will not have advanced to far by then. 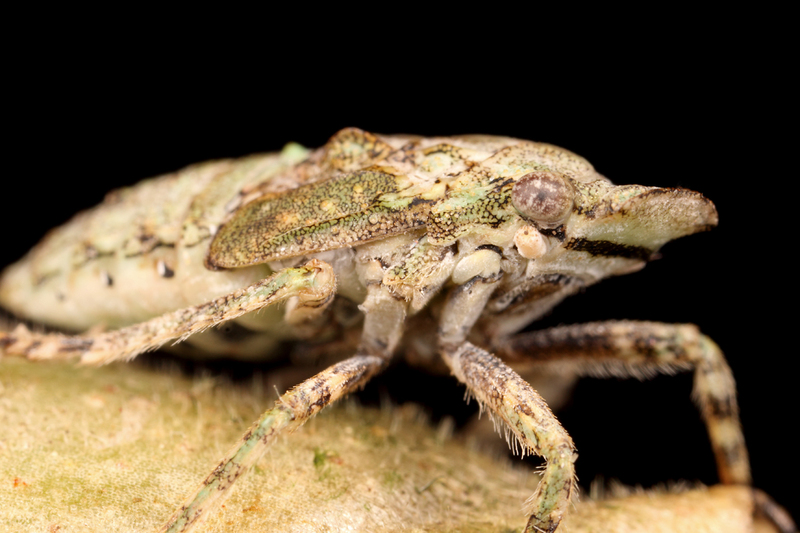 This entry was posted in Hemiptera and tagged Argentina, bugs, entomology, insects, nature, photography, planthoppers, science, techniques. Bookmark the permalink. Last shot is amazing! Thanks for the tip of shooting from under and not that much from the top. Shows you, taking photos of insects isn’t that easy! Thanks, scrapydo. Hard but fun! Cool pics especially the face that is looking straight at me! The article is educational too. Getting down and low in taking pics really gives! I also have been doing this recently in capturing pictures especially close-ups and I get pretty interesting results. Thanks, maritesmabugassimbajon (that’s quite a name) – and welcome to BitB! I hope we’ll get to see the adult of this one soon . . .
Amazing camouflage and beautiful pictures. 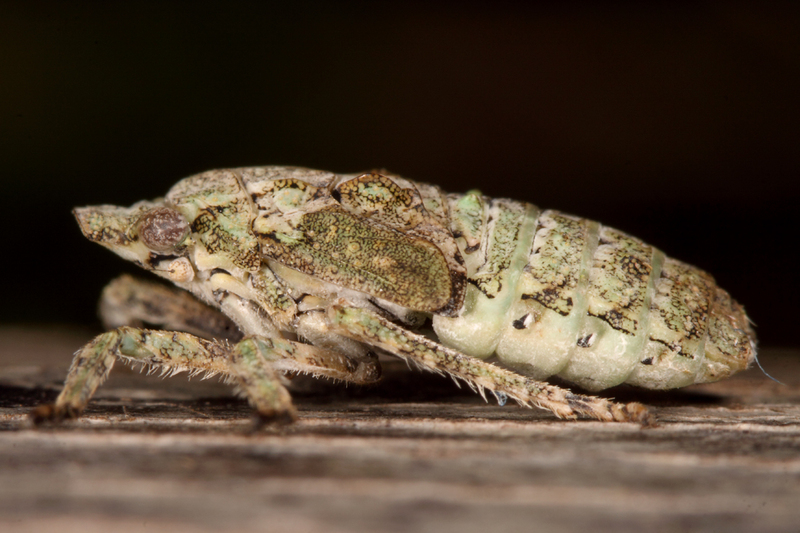 I was fascinated by the exoskeletons of cicadas I found last Fall on our white ash trees. So much so that I check out a video on youtube of cicadas molting. Are there several kinds of cicadas? How many kinds exist in North America? Also, is there any data on how loud cicadas can get? Thank you, Vidya. Periodical cicadas get all the attention, but these are actually only 7 of the 194 species of North American Cicadas. I have heard that the loudest insect on earth is a cicada species in Africa that can be heard over a distance of more than a kilometer. Fascinating creatures! Nice to come away with a little treasure– i like the idea of getting really low and even from below to shoot pictures of the bugs. I have been photographing bugs found on our farm, so this is helpful. p.s. I love sardines — good dining! Definitely not a sacrifice to have to eat sardines – nothing better than brislings on a triscuit! Hi Ted – did you ever get an ID beyond family for this one? I found a nymph in my neighborhood in Buenos Aires this weekend, looks exactly like yours. I got it to Fulgoridae but was not able to rear it to adult, I will go back and search the surroundings and see if I can’t find the tree it came from. Thanks for your beautiful photos! Hi Sarah – the the family Fulgoridae was the best I could do with this one. I hope you are successful at finding another one and rearing to an adulthood, I’d love to know what the adult looks like.